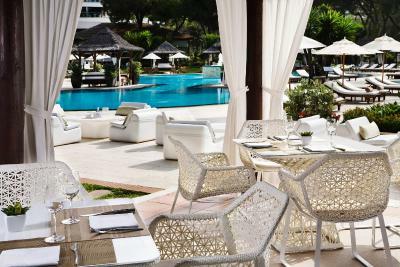 Lock in a great price for Gran Meliá Don Pepe – rated 8.9 by recent guests! Great location, good facilities and Very comfortable rooms albeit on the smaller side with good amenities. Great pools and ambience the TBone restaurant was excellent love the new bathrooms! 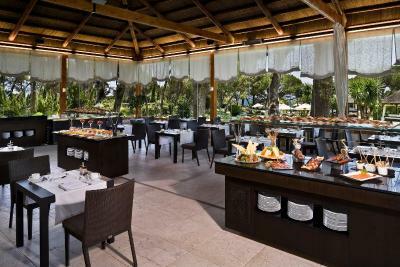 Great location, nice outdoor pool area, fantastic breakfast. The lobby , the pools and the settings. The staff at red level lounge (special mention to Claudia). Many services and facilities available. Excellent clean hotel with friendly and helpful staff. Great location, Great food and classy bars. Right from the very moment you arrive the staff at Gran Melia Don Pepe are fantastic, and so customer focused. 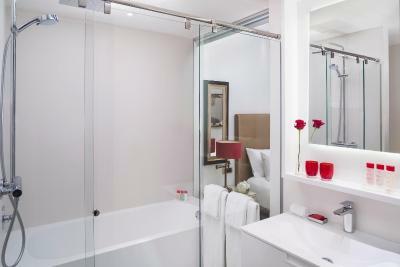 Red level service is second to none too, and we love it. Food, service, accommodation and the whole hospitality package is excellent. We have stayed at the hotel many times and it is out no.1 choice every time we are visiting the area. Would recommend it to anyone. Good quality pool towels, clarins products in the room. Birthday acknowledgment with a bottle of cava for my husband. Peaceful hotel grounds and excellent location for old town, beach, shops, restaurants. Breakfast was exceptional. Gran Meliá Don Pepe This rating is a reflection of how the property compares to the industry standard when it comes to price, facilities and services available. It's based on a self-evaluation by the property. Use this rating to help choose your stay! 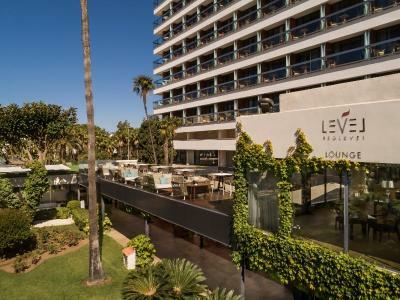 One of our top picks in Marbella.Gran Meliá Don Pepe is located on the seafront next to Marbella's Don Pepe Beach, 15 minutes' walk from Marbella Old Town. 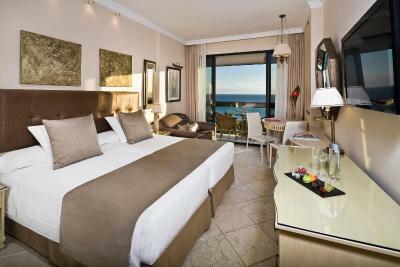 It offers 3 outdoor pools and a spa, and each luxurious room has a large plasma-screen TV. 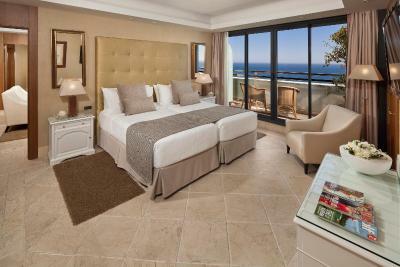 Rooms at the 5-star Don Pepe have views of the sea, hotel gardens, or mountains. They offer interactive satellite TV, an electronic safe and a mini-bar. All rooms have free Wi-Fi. Guests of the hotel receive free access to the heated indoor pool and gym. The hotel also has 2 tennis courts and 2 paddle courts. The spa includes a Turkish bath, hot tub and sauna, and offers various massages and treatments. 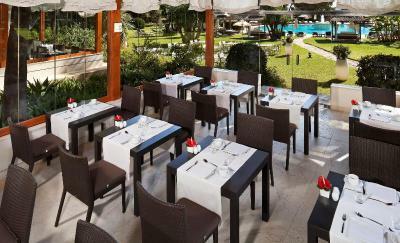 The hotel also has a grill restaurant specializing in steak, and Mediterranean and barbecue specialties. Its Tahini Restaurant serves Japanese cuisine and offers ocean views. 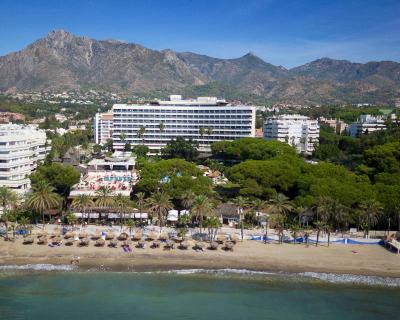 Located on the popular Costa del Sol, Gran Meliá Don Pepe is just a 5-minute walk from Paco Cantos Park. Marbella’s historic old town is less than 1.2 mi away. 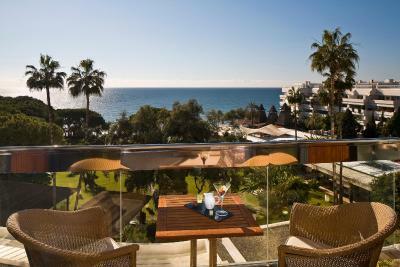 When would you like to stay at Gran Meliá Don Pepe? 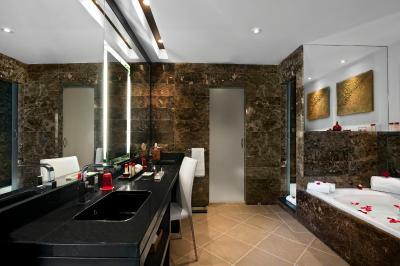 This spacious suite has a lounge, a marble bathroom with a spa bath and hydromassage shower, and a private balcony with panoramic views. This room has VIP toiletries, a pillow menu, Nespresso Coffee Machine, scent menu, and ironing service of one item per stay. Wii, Playstation or DVD player are available under request. This room offers views of Sierra Blanca mountain range. 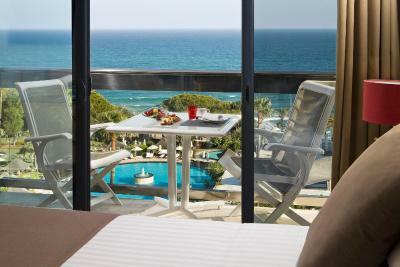 This room has a private balcony with wonderful sea views. Featuring a private balcony with attractive sea views, this modern room features a satellite TV, a mini-bar and a private bathroom with a hairdryer, bathrobe and slippers. These rooms are located between the 4th and the 7th floor. 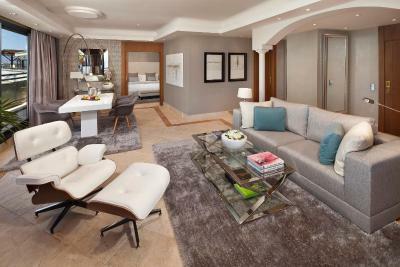 This modern suite has a private balcony with sea views. 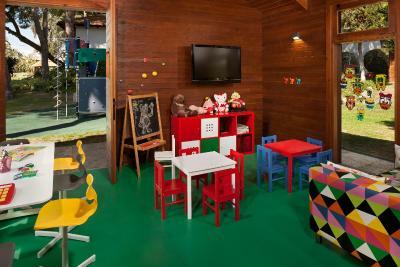 It has a lounge area with 2 flat-screen TVs and an iPod docking station. 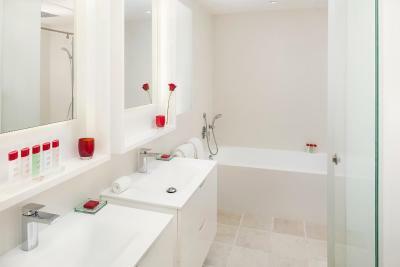 The private bathroom includes a bathtub, a rain shower and Clarins toiletries. 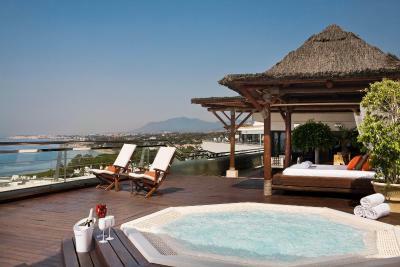 Located on the top floor of the hotel, this suite offers a spacious private terrace with a hot tub, Balinese bed and fantastic views of the Mediterranean Sea and across to Africa. 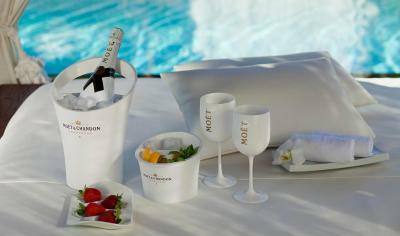 The terrace also has a designer bar with a free bottle of Moët & Chandon champagne and putting green. 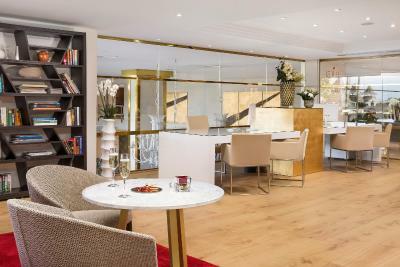 The suite's stylish lounge features a piano, as well as a photocall area. Guests can make free use of one Balinese bed by the pool. 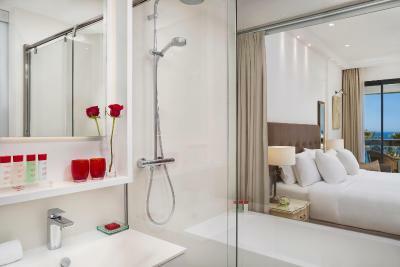 This large, luxurious suite is located on the 8th floor and features 2 bars, a spa bath, Balinese bed and a large dressing room. 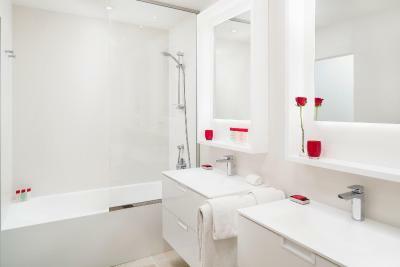 The suite includes red level service. 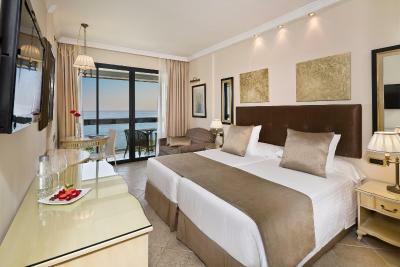 This double room has a tile/marble floor, satellite TV and air conditioning. 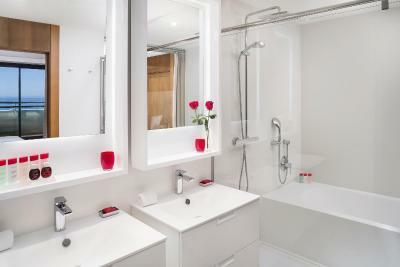 This double room features a mini-bar, flat-screen TV and tile/marble floor. House Rules Gran Meliá Don Pepe takes special requests – add in the next step! Gran Meliá Don Pepe accepts these cards and reserves the right to temporarily hold an amount prior to arrival. Breakfast wasn't the best, not much choice at all, despite other reviewers saying the opposite. Coffee served wasn't good either. Disappointing as we were really looking forward to a slap up breakfast, also would have thought toast would have been served. Cant stand waiting in a queue to toast my bread whilst everything else goes cold, or toast goes cold when getting breakfast - just can't win with that set up. It is 5 stars after all. Beautiful location, top class facilities, especially as we booked into red level so had a private check in. Staff were all lovely. 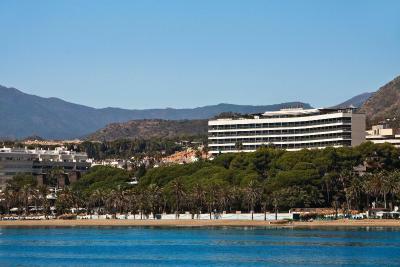 The best location in marbella. I booked specifically for an indoor pool this time of year but extremely disappointed that the pool had closed for refurbishments/repair especially half term when we went so did not spend much time at all at the hotel when we paid so much. We were only told on arrival when I asked. Breakfast, location and staff at breakfast execellent. The reception areas have a wonderful perfume in the air. The breakfast buffet was very good quality. €18 a day to park at a 5 star hotel??? Lovely location right on the beach front. Breakfast is excellent. Best location and warm welcome from everyone, i really recommend this place!!! the breakfast is excellent,plus the ambiance is very good.